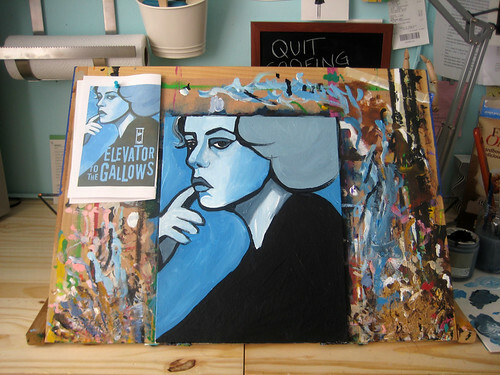 I really love the poster artwork for Elevator to the Gallows, but I can't afford a poster of my own right now -- so I decided to paint one myself :) I think the blue is going to look great hanging up in my aqua colored room! Whoa! Um, you by far out did the poster. I'm looking at it right now. No comparison. wow it looks exactly like the poster! Wow that is fantastic! For a second I thought they were both the same!!! Great work it really is a beautiful image, now I want to see the movie!!! Wow. That looks amazing. Great job. you paint so good why would you ever bother buying a poster. really nice work.